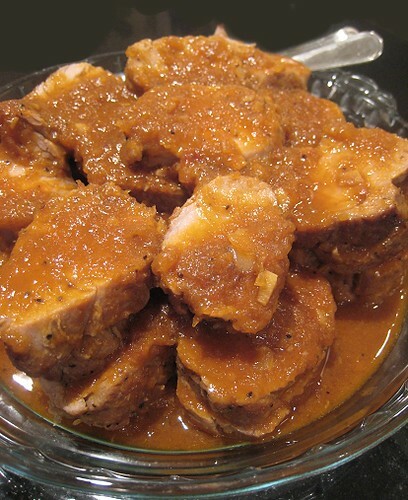 I was a tad lost what to serve as another dish for a get-together several months ago, and I had a few pork tenderloins waiting in the fridge. I am always apprehensive when making something with pork tenderloin, especially after that one experience when we overcooked pork tenderloin and ended up with gray cardboard. That was probably the only time I experienced meat that was actually inedible. That was a couple of years ago and I believe it was a jerked pork tenderloin. I was so looking forward to having it for dinner. When I came home, I was terribly disappointed that the pork was left in the oven to dry. There was some stomping and sulking involved that day, although the more mature side of me realized that, of course, it was an accident. 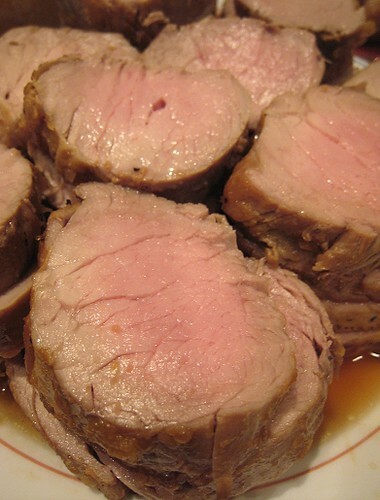 For this pork tenderloin asado, I was careful not to overcook the pork. 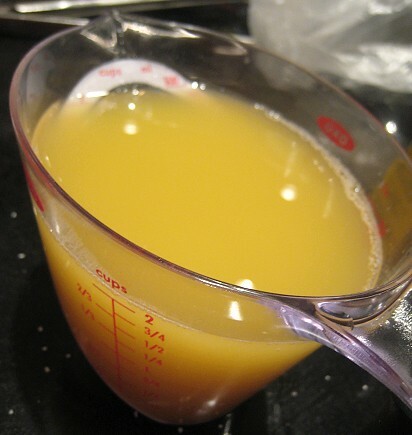 [ts] Pineapple juice for the sauce. 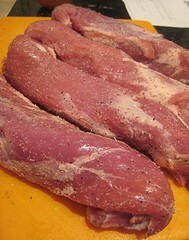 I came across a recipe for "asado" on Cookmobile's site. The recipe called for using pork loin, so we had to make adjustments in the method to ensure that our tenderloins would be perfectly cooked. [ts] The pineapple chunks had nowhere to go, so we decided to use them as well, giving them a buzz before we did. Although I have often heard the term "asado" in Filipino cookery, I have no fixed idea of what "asado" should taste like. See, it seems to me that the word is used to mean different pork dishes altogether. There's a siopao filling that we call "asado," which is a sweet-ish, brown-ish braised pork that's somewhat similar in taste to char siu, although without the more star anise-y, licorice-y aspect of char siu. But, there's also another "asado" I came across that are thin slices of pork that are sometimes red-ringed, recalling char siu, but not at all similar in taste to char siu. Anyways, I am getting confused just trying to distinguish and describe their different flavours, especially as it has been quite a number of years since I've had both versions of Filipino "asado." [ts] The tenderloins were seasoned, then browned. 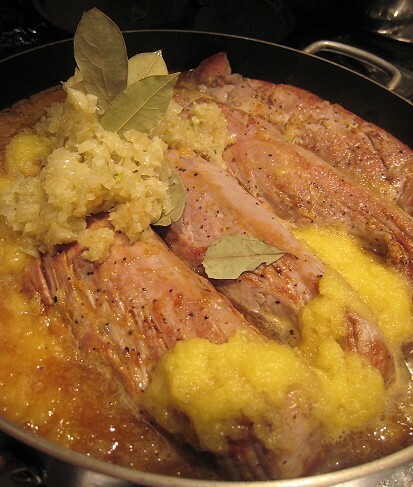 When I came across Lalaine's recipe for asado, I wondered what kind of asado it would be. I knew it wasn't going to be like siopao asado and I secretly hoped that it would be the other asado that I ate in Ongpin restaurants back in Manila. [ts] The tenderloins braised in pineapple juice, the puréed pineapple chunks, some canned tomatoes, a little soy sauce, a few dried bay leaves, a lot of minced garlic, and some chopped onions. 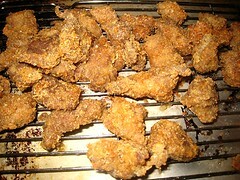 [ts] After braising, the tenderloins were pulled out and sliced. What a nice pink; not overcooked! 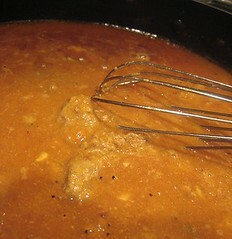 [ts] To give the sauce a certain richness, we whipped out the liver spread! I was quite scared at this point, as I hate liver. But, JS insisted that we not omit this step. 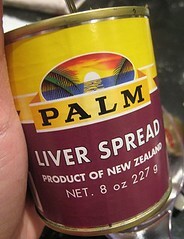 I guess I should be grateful that we didn't use "real" liver. 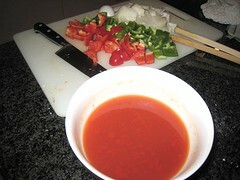 I whisked the liver spread into the sauce. 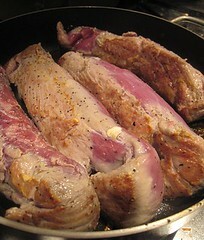 [ts] The liver-enriched sauce, poured over the sliced pork tenderloins. 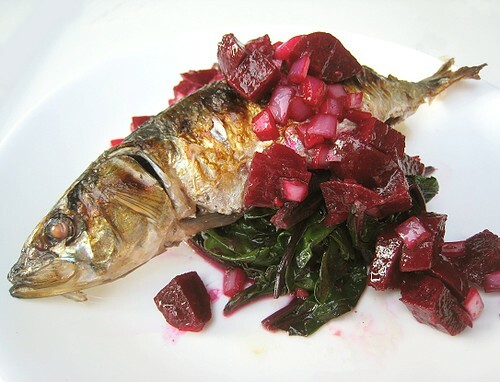 I can't quite say it is "the other asado", but I do like this dish. It was very flavourful, with bright, sweet notes coming from the pineapple and a very umami background coming from the liver spread. The liver spread really added that je ne sais quoi that made the whole dish for me. Ack, we haven't been able to come up with posts during this week! I have pictures ready, but they don't have copy yet. I really don't know what's keeping us so busy. So, in the meantime, here's another edition of "Leftovers" -- and I believe if you see the pictures, you'll see why they didn't get their own posts. 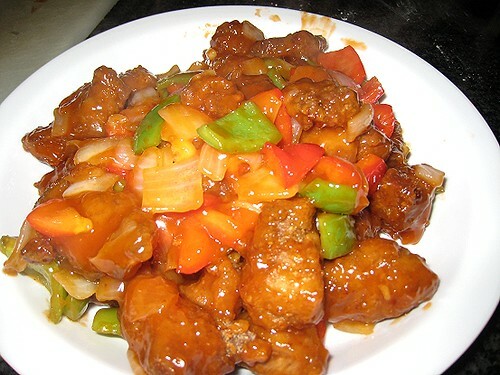 This is CSC's sweet and sour pork. It was very good! Unfortunately, these pictures were taken very early in our blogging career. 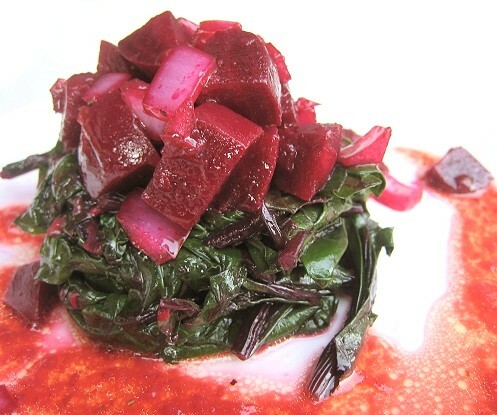 Perhaps we will make this again and take new photos, then post it with the recipe. 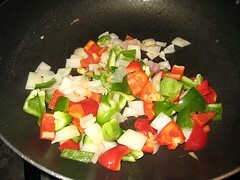 The "kung pao" is in quotations because it didn't turn out quite right. 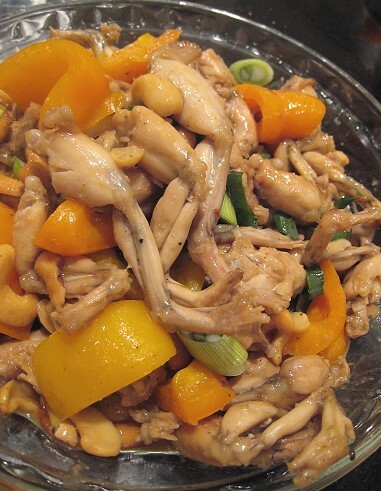 The dish was still tasty, but in an "other Chinese" kind of way, not a kung pao way. 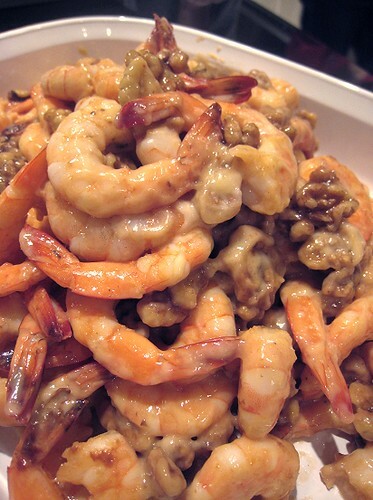 Shrimp in a honey-sweetened mayonnaise sauce, with candied walnuts. Always a crowd-pleaser. 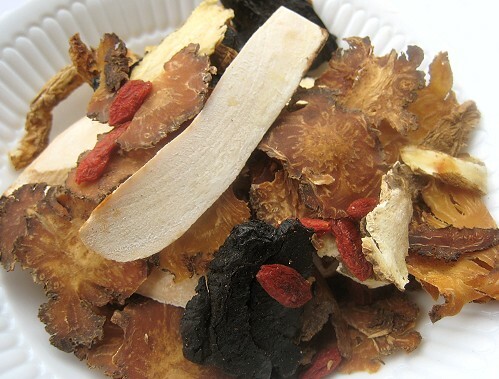 四物 "Si wu" is a blend of Chinese herb-/medicine-y things. That up there has wolfberries (goji berries), white peony root, Chinese foxglove root, Chinese Angelica root, and Szechuan Lovage Root. 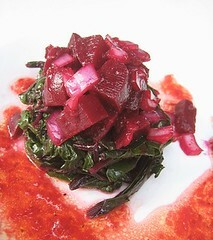 Actually, I only knew about the wolfberries; I didn't have the faintest clue what the other ingredients were. 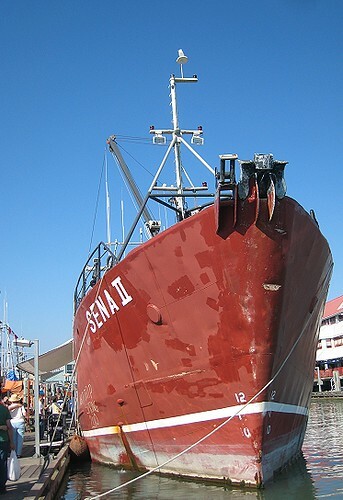 "Si boot" is the Fujian (Hokkien) pronunciation of "si wu". 四 -- "Si" -- actually means "four", so I don't know if this pack that my mother bought is actually "si wu", or some other blend of ingredients, since it has 5 components. But, all our life, Mama would call this concoction with wolfberries "si boot". So, who knows! 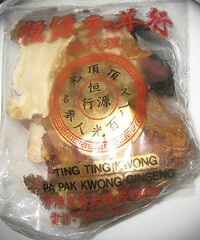 Chinese medicine thingies are a big mystery to me. 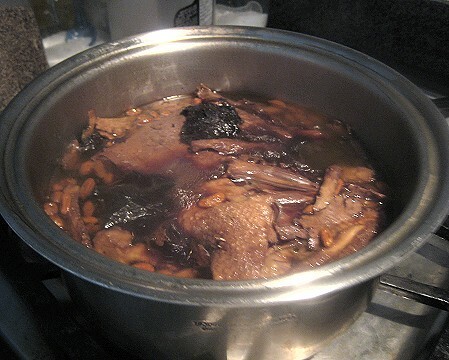 Because of that, and because of the fact that there is no picture of the finished product, we couldn't write a post about this soup. Whatever this blend of "herbs" is actually called, making a soup is dead simple. 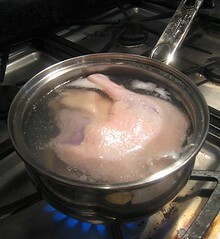 There's some water, there's some meat... 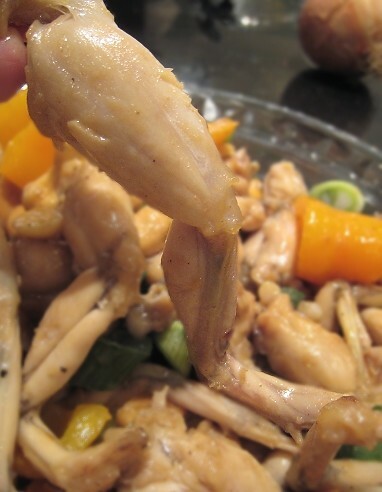 In this case, a couple of duck legs. Yes, it does get scary-dark like that. 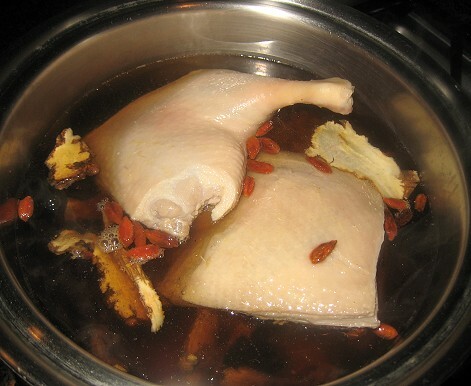 Honestly, I can't stand the Chinese medicine taste, although some people do like these medicine-y soups a lot. That's all the Chinese "leftovers" we have for you today. 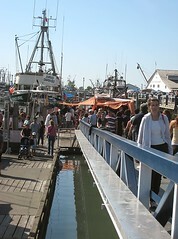 TS had this Wild BC Seafood Fest pencilled into her calendar, and lacking anything better to do on a sunny Saturday afternoon in late August, we decided to head on over to Steveston (Richmond, BC) to partake. The event starts at 11 in the morning and ends at 4 in the afternoon and we got there at around 3. Somehow, we dawdled and dawdled until it was almost too late. We got there too late to see the cooking expo being given by the Provence team. 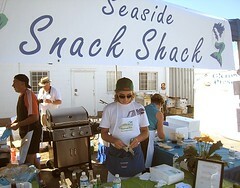 Still, we managed to score some tasty eats from some of the vendors there. 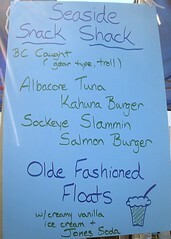 I don't think I had a proper lunch before going to the Fest, so I eagerly ordered a sockeye salmon burger from the Seaside Shack family. 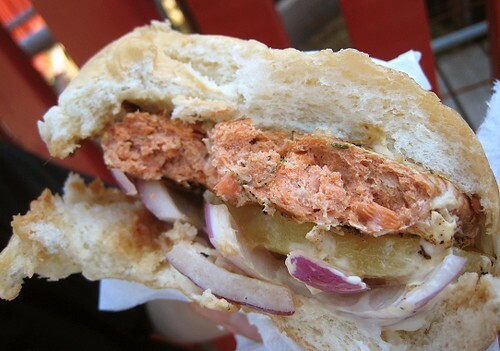 I was very pleased when I bit into the burger: although it was a tiny bit dry, it was very tasty, with a mouthful of salmon in every bite. This was pure salmon, no filler, and I love me my sockeye salmon. I wanted to order the tuna burger but they were sold out. No matter. I wasn't really hungry. 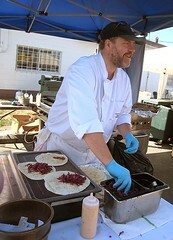 We also saw the [C] crew, headed by Chef Robert Clark, serving up some pink salmon tacos and we grabbed one to share. 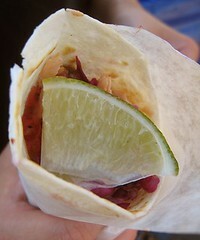 It was served with a lime wedge which we promptly squeezed all over the taco. 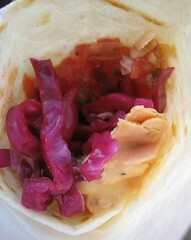 The shredded cabbage, which was pickled, went surprisingly well with the salmon. There were other booths/vendors, but no need for photos. 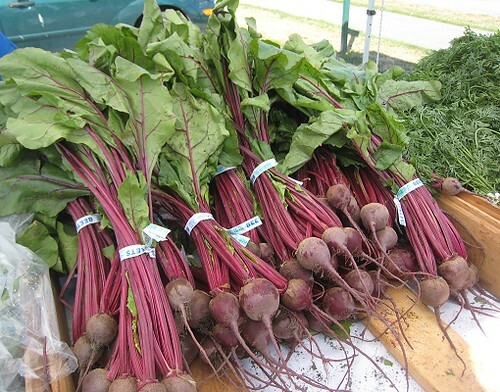 We just so happened to buy a couple of bunches of beets from a vendor. Then, we saw this sign. 6 sardines for $5! We were quite happy to be scoring such a deal! With some sardines in hand, we realized we had to leave pretty soon, seeing as they're perishable. 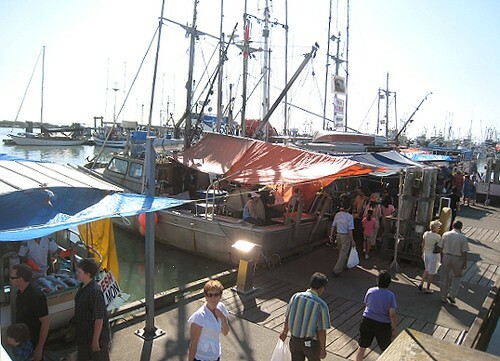 However, since they were frozen, and since we were already in Steveston, and since we haven't been there for 10 years, let's say, and since it appeared that a lot has changed (a lot more shops), we decided to stay for a little while longer and get out of the fest environs to walk towards the fisherman's wharf. Were we glad we did! That, my friends, is the fish market! As JS and I remarked, "So this is where they hide the fish!" There were quite a number of shrimp vendors; there were snapper for sale, sole, etc. 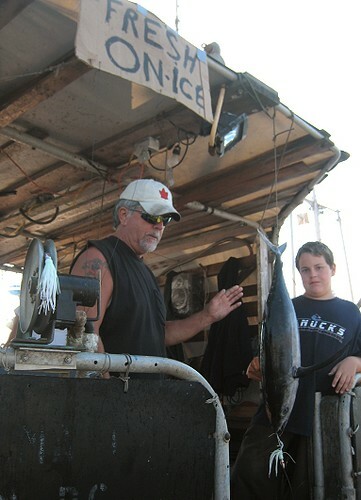 But, more importantly, there were halibut and tuna fishermen! 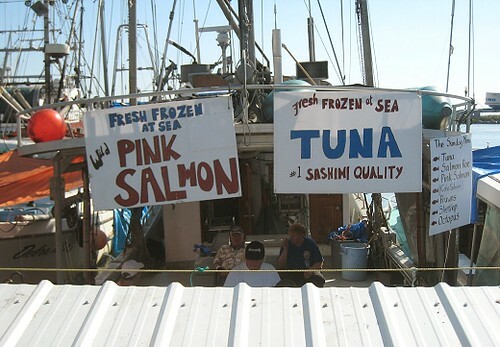 We almost always never buy halibut and tuna because they are just too expensive. But, pricing here seemed to be very reasonable. There's tuna for sale. The catch was, of course, that one had to buy the whole fish. Tuna is big! 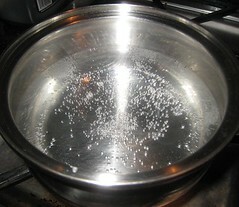 But, now that we know a source for not-ghastly-expensive tuna, we can actually imagine making something-tuna at home. Ah yes, that above is the largest ship there. One might say, the rock star of the boats. 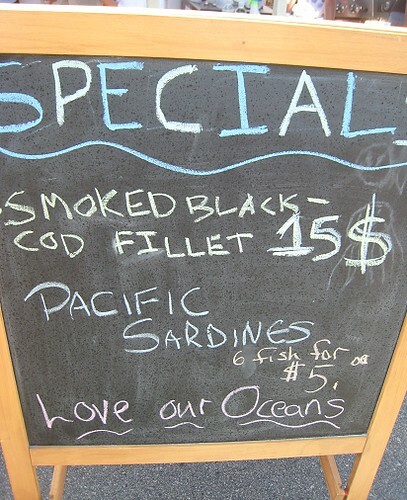 They were completely sold out of their rock star item, black cod (also known as sablefish). Oh, walking along the boats, we spotted one selling sardines. They were selling 8 fish for $5! That's 2 more fish than the vendor at the Wild BC Seafood Fest for the same price! Man! We had no choice, we had to get the 8 sardines. 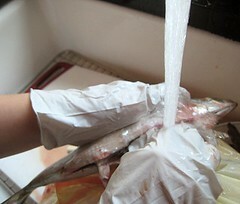 First thing, cleaning the sardines. 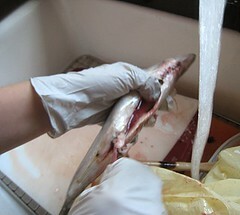 Just thinking about having to gut and clean the sardines made me want to chuck the sardines altogether. 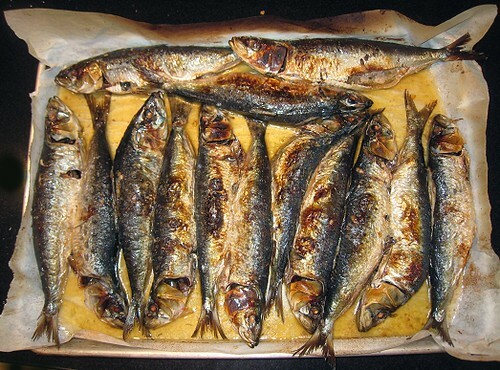 However, I persevered, consoling myself with the fact that there are only 14 sardines to be gutted and cleaned. I put on the gloves and got to work. I used both the roots and the greens. I must say, they were the dirtiest greens I had ever come across. 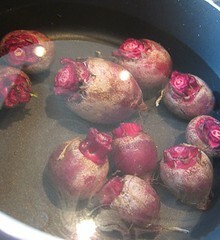 To cook, the beets went into water with a touch of vinegar. 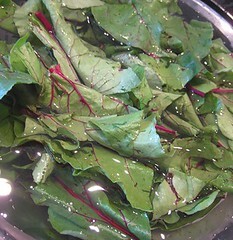 The beet greens were washed multiple times, then were finally wilted in a wok with some garlic. 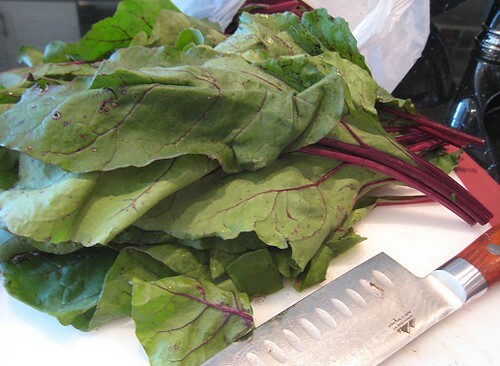 I decided to make a salad using the wilted greens and the cooked beets, so I diced some red onions (pinkish purple, like the beets!) 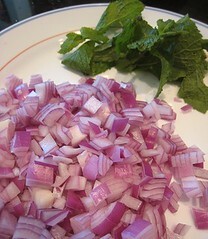 and picked a few mint leaves for that purpose. 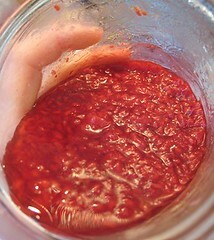 We had some not-too-sweet raspberry sauce we made a while back sitting in the refrigerator, lonely from being left alone all this time. 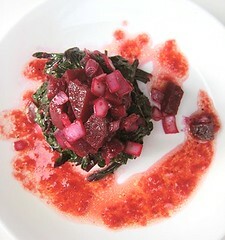 In keeping with the red-pink-purple theme, I decided to use that to make raspberry vinaigrette. 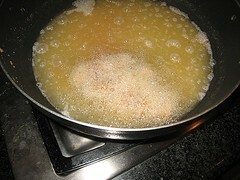 I simply mixed together the raspberry sauce, some vinegar and/or lemon juice, some olive oil, then seasoned with salt and pepper. 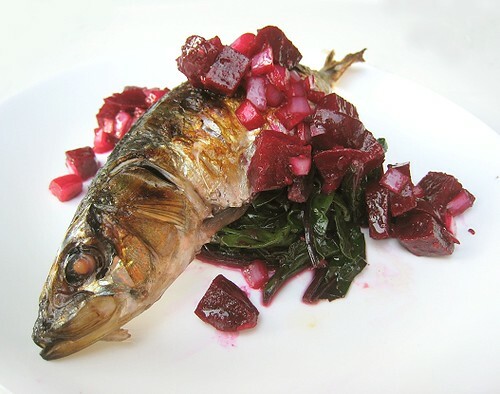 As for the sardines, we simply broiled them, like we do with our mackerel: a generous amount of salt, some oil, and then we wait until the skin blisters. Of course, if you have the grill ready, that would also be very nice indeed. I guess you could say that that Saturday afternoon was well-spent after all.